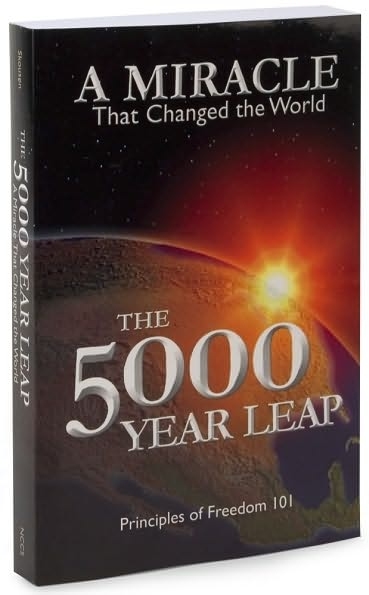 Last December, while gathered with relatives to celebrate Christmas, my uncle generously gifted each family with a copy of The 5000 Year Leap by W. Cleon Skousen. Inside the front cover was a note scrawled in my uncle's hand, “May you find the principles contained in this book enlightening and refreshing and may you find them great teaching legacies.” I remember him commenting that this and the Bible are the only books an American needs. The Bible will take care of our souls, and this book will take care of our country. I delved in soon after the holiday season but did not finish until recently, nearly a year later. Why so long? Virtually every square inch of print is informative. You see, it was designed for the classroom. In fact, at the bottom on the front it says, "Principles of Freedom 101." I rarely got through more than a few pages per day, and at times didn’t pick it up for a month. Yet, I am glad I stuck it out! All in all, the book is excellent. It provides wonderful insight into the thoughts of our founding fathers and the various circumstances that molded their opinions. They felt enormous responsibility in forming a new nation and sacrificed tremendous time and money in the undertaking. They looked on public office as a calling rather than an outlet for fame or fortune. Many heavy questions needed answering. What form of government is best? What does freedom mean, and how do we preserve it? They drew knowledge from the sources available to them in the areas of history and philosophy, and they had the examples of other nations. After observing firsthand the mistakes being made elsewhere, they did not want to repeat those. In their minds, America SHOULD and WOULD be a blessing to peoples everywhere. I am especially delighted that this volume emphasizes that the Constitution is not out of date. It is no more out of date than the desire for peace, freedom, and prosperity is out of date. The Founders were not custom-building the Constitution for any particular age or economy. They were structuring a framework of government to fit the requirements of human nature. These do not change. What protected the freedom of George Washington will protect freedom for you and me. Is it not so? Though technology advances and borders are altered, the heart of humanity deviates but little. We are ever pursuing, building and destroying in much the same manner as our ancestors with the same dreams and desires. In fashioning a Constitution (a set of laws to bind down our rulers), the Founders were seeking to address the problems of flawed humanity for the sake of peace and prosperity. Our constitution will not be outdated, so long as man is unchanged in essentials. There was hardly a single idea which the American Founding Fathers put into their formula that someone hadn’t thought of before. However, the singularity of it all was the fact that in 1787, when the Constitution was being written, none of those ideas was being substantially practiced anywhere in the world. It was in America that the Founding Fathers assembled the 28 great ideas that produced the dynamic success formula which proved such a sensational blessing to modern man. There is definitely a great abundance of quotes, both by the Founders and by others who were influential. The book also does a fine job of dispelling some myths. No one who reads the words of Thomas Jefferson could believe the rubbish that is often stated about his beliefs, especially by those who oppose religion. They are fond of pulling out isolated quotes and using them to justify all sorts of things that he would be completely against. Benjamin Franklin, too, has been tarnished over time, as have probably all the founders in one way or another. I find that in every area of knowledge there is an effort to distort and corrupt. It is present in science, history, literature, politics, and everything in which man has a hand. The United States has been involved in three major wars, including the holocaust of World War II. Looking back, one cannot help wondering how much happier, more peaceful, and more prosperous the world would be if the United States had been following a policy of “separatism” as the world’s great peacemaker instead of “internationalism” as the world’s great policeman. It looks good on paper, but the founders were not forming a country during World War II. There were no nuclear bombs that could destroy vast areas of land and kill thousands within a few seconds. In addition, our country was but a baby struggling to take its first steps. We had more pressing matters here at home than to worry about the rest of the planet. But once we became strong, I believe we had more responsibilities. With great power comes great responsibility, does it not? The author asks how much better off the world would be had we not intervened. If we had ignored the Holocaust and closed our eyes to the attack on Pearl Harbor, would the world indeed be better today? Would it be happier, more prosperous and peaceful? I don’t think so. I am not one for standing idle, while millions of people are being slaughtered by dictators who want to take over the world. Though I believe the Constitution is timeless due to the unchanging nature of the purpose it serves, I disagree that the separatist philosophy can be applied to our present day. For the most part, I agree with the rest of The 5000 Year Leap. It is a fantastic volume on political philosophy, definitely worth buying. I’d like to see every student in the United States read it as part of U.S. Government classes. Actually, it would be nice if everyone serving in public office would read it too and take its lessons to heart!